The background of your desktop is the image or color that appears behind all of the icons and windows on your desktop. Fedora comes with a good number of backgrounds to choose from. Some are photos or graphic artwork that can take the the entire desktop to display and others are patterns that can be repeated to produce a wallpaper repeating effect. Figure 21: The KDE Background Control Module allows you to select many types and variations of backgrounds for your Linux desktop. The KDE Background Control Module allows you to select many types and variations of backgrounds for your Linux desktop. You can choose from many available pictures and wallpapers, solid colors and various blended colors graduated in several different patterns. To choose a picture or wallpaper, be sure that the Picture radio button is selected in the Background box. The drop-down selection box will display a list of available pictures and background patterns from which you can choose. The folder icon to the right of the selection box allows you to browse the file system including your home directory and its subdirectories for other patterns and pictures. If you want to use a picture of your family or pet or city, click on the folder icon and locate the picture you want to make your background and select it. 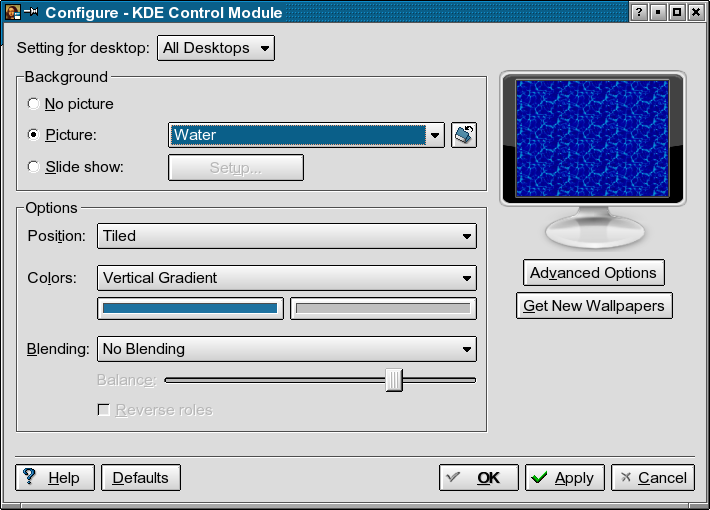 Figure 22: After selecting the Water image, the KDE Background Control Module determines from the small size of the image file that this image should be tiled to create a repeating wallpaper effect. In the Options box you can choose whether the picture you chose will be scaled to fit the entire desktop as is shown in Figure 10, or whether it will be repeated. If the picture you chose is a wallpaper pattern you will want to choose the Tiled option to cause the image to repeat. In most cases the Background Control Module is smart enough to determine that a small image should be tiled to produce the wallpaper effect and will change that setting automatically for you. If you are connected to the Internet, the Get New Wallpapers button opens a link to the KDE web site so you can easily download new background images. 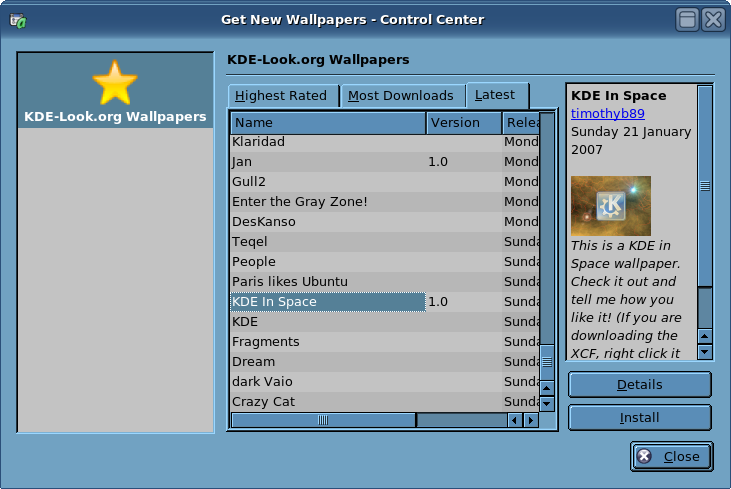 The Get New Wallpapers window, as shown in Figure 23, displays a list of the wallpaper images available from www.KDE-Look.org. In Fedora Core 4 and earlier, this window is called Get Hot New Stuff. There are three tabs at the top of the window that allow you to view the available images by the ratings given them by users like yourself, the images that have the most downloads, and the most recent images. In general, you will find that the three lists contain many of the same images, but there always a few that appear in only one or two lists. Figure 23: Downloading background images to use as wallpaper from the KDE-Look.org web site. It doesn’t get any easier than this. These lists are limited in size to ensure a reasonably short download time for the lists on dial-up connections. There are many more images available than appear in these lists. If you want to search for some of the more obscure ones, you can use your browser and go directly to www.kde-look.org to search among the thousands that are there. Note: All of the images downloaded using either of these methods are only available to you on this computer. Other users on this same computer will not have access to these images. If it is desirable to make the images you have downloaded available to other users on the same Linux computer, they can either download the images themselves – but that would unnecessarily use additional disk space – or you can contact your system administrator (root) to move the images to a location from which all users can access them.